In the late 19th Century a travelling circus like no other criss-crosses Europe and America. Arriving without fanfare it suddenly appears outside a town and then stays for a short time, only opening at night and at all times remaining enigmatic and mysterious. To its devoted fans it is the greatest show on Earth, but there is more to the circus than just a place of entertaining, it is also the setting for a battle of wills between two determined magicians and the circus itself is what they use to compete against each other. This is a relatively unusual book, or at least it's not quite like anything else that I have read. The most obvious comparison is to another tale of rival 19th Century magicians, "Jonathan Strange and Mr Norrell", it shares that novel's languid pacing and carefully crafted prose although the actual writing style and plot progression is quite different. 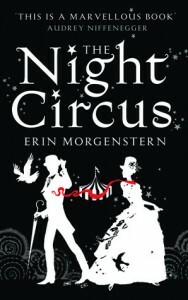 The titular Le Cirque des Rêves is more than just the setting for the plot, arguably the book is more about the circus itself than it is about the rivalry and romance between Celia and Marco, and there are frequent interludes of second-person narration describing one of the circus' wondrous attractions. It is one thing to tell the reader that something is magical, enthralling, mystical and other-worldly and an altogether more difficult trick to actually show that it is, and the novel wouldn't work at all if the author didn't make the reader feel it is as fascinating as the characters think it is but I think Morgenstern does an excellent job of conveying why the circus is so special. At the same time as showing how wonderful the circus is, there's also a (sometimes subtle) undertone of darkness and impending tragedy. The characters may largely be happy and proud of what they are doing but they also feel increasingly trapped as the story progresses and in the background lurk the two rival mentors of Celia and Marco who are sinister and intriguing in equal measure. As the novel goes on some of the circus' mysteries are revealed and the story becomes increasingly compelling in the later stages as Celia and Marco try to both save the circus and avoid their fate. One area of the novel where I have slightly mixed feelings in the characterisation. There are interesting characters in it, the three main characters are all likeable and there are some memorable supporting characters (particularly the circus' eccentric patron), but at times the characterisation is maybe a bit too enigmatic. Given that Celia and Marco are meant to be trying to outwit each other and they're both magicians by trade who specialise in changing people's perceptions of reality it does make sense that some of their motivations may be concealed. This becomes a bit of a problem when the two of them falling in love is such a crucial part of the plot, but in this case it felt more that we were told they had fallen in love but we weren't really shown it convincingly. It also never really answers the question of why they don't try to rebel more against some of the harsh treatment they receive from their mentors. Although it isn't perfect, this was an entertaining and fascinating book that was a magical read in more ways than one. PS - they say that you should never judge a book by its cover, but the black-white-and-red colour scheme of the hardback edition including black-edged pages is very striking and fits in well with the novel's ambience. In this case I'm not sure reading the e-book edition would be quite the same experience.